It's official: Denmark is buying new fighter jets -- and Lockheed Martin (NYSE:LMT) will build them. Out with the old, in with the new. Denmark is replacing Lockheed Martin F-16s (right) with brand-new F-35A stealth fighter jets -- also from Lockheed. Image source: Lockheed Martin. For more than a decade now , Denmark's politicians have hemmed and hawed over which plane to pick to replace the country's aging fleet of F-16 Falcon fighter jets. With Denmark one of the nine countries that originally signed up to help design and build Lockheed Martin's vaunted F-35 stealth fighter jet, you might have thought that would be an easy decision to make. Nonetheless, after getting a gander at the F-35's gold-plated price tag, Denmark apparently had second thoughts, and insisted Lockheed fly head-to-head against Boeing (NYSE:BA) which offered its F/A-18 Super Hornet as an option, and Eurofighter, which offered the Typhoon, to win Denmark's business. That competition has finally wrapped up, however, and the results are in: Lockheed wins. Last week, in a joint announcement by the Danish Prime Minister and Defense Minister, Denmark confirmed that Lockheed Martin has won the competition. Just as soon as Parliament OKs the purchase, the Royal Danish Air Force will start the process of acquiring 27 F-35A fighter jets. The cost, estimated at $4.5 billion, will be worth more than 9% of annual revenue to Lockheed Martin. That's of course grand news for Lockheed Martin. Combined with recent news that the company has driven down the price tag on its F-35s to less than $100 million (for U.S. buyers, at least), it looks like the F-35 is getting some lift beneath its wings again. And with 27 new planes among which to spread out development costs, the F-35 will likely get incrementally cheaper for future buyers. In the course of evaluating its various options, Denmark concluded that the F-35 offers superior "survivability" relative to either the Boeing F/A-18 or the Eurofighter Typhoon. The Danes found the F-35 to be more "mission effective," and said it has more future development potential as well. They decided the F-35 is actually cheaper than the competition, too. For an aircraft that's been so heavily reported to cost $1.5 trillion, that's a pretty astonishing conclusion. But the well-known $1.5 trillion figure refers to the entire cost of buying and maintaining some 3,100 F-35 fighter jets, in all three configurations, over a period of 60 years. When Denmark was evaluating the plane's cost (and those of its rivals), they did so in the context of what it would cost to buy a set number of aircraft and operate them for a term of 30 years. What you see above is what Denmark concluded those costs would be, per plane . And as you can see, they found the F-35 to be cheaper than any alternative. 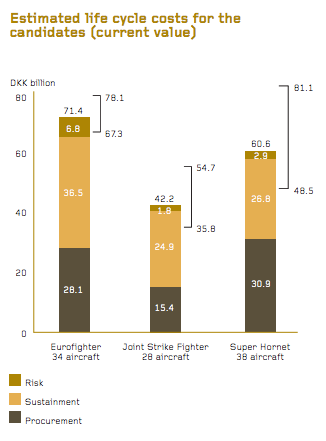 Is Denmark right about the F-35 being cheaper than the Boeing F/A-18 and the Eurofighter Typhoon? That remains to be seen. (Ask me again in 30 or 60 years.) What's important right now is that in a head-to-head competition, Denmark has concluded that the F-35 is the cheapest plane of the three -- and as the only fifth-generation combat jet in a field of fourth-gen warbirds, the best-quality plane as well. That's a big vote of confidence in the F-35, and one that should go a long way toward reassuring future buyers of the aircraft. It's a rare bit of good news for Lockheed Martin investors as well. 4 out of 5 Danish dentists agree: Lockheed's F-35 beats Eurofighter's Typhoon. Image source: Lockheed Martin.